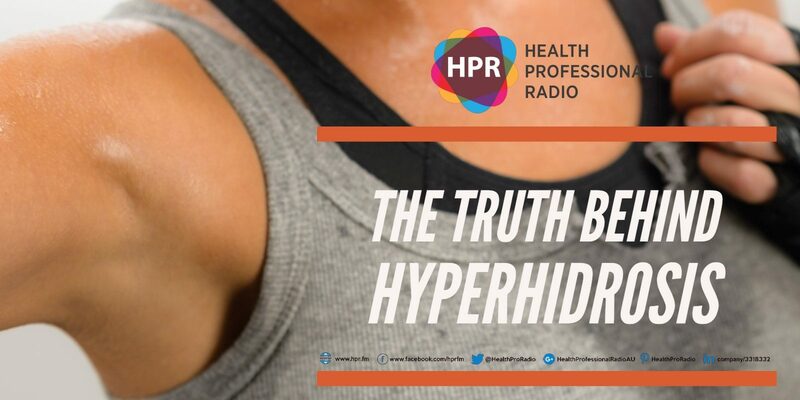 Dr. Shobhan Manoharan, Dermatologist and Director of Brisbane Skin joins HPR host Tabetha Moreto in conversation, where he discusses hyperhidrosis, the causes and the available treatments for it. He also talks about his passion for dermatology and his desire to help people with conditions such as hyperhidrosis. Guest Bio: Dr. Shobhan Manoharan is a specialist dermatologist and the Director of Brisbane Skin. He is also co-director of Westside Dermatology, and founder and co-director of Sweat Free Clinics and The Psoriasis Institute. Dr. Shobhan has a special interest in acne and acne scar treatments, hyperhidrosis treatments, pigmentation disorders, laser rejuvenation and skin cancer management. He is also medical and cosmetic dermatologist to numerous high profile celebrities, appearing in the memoirs of the English Cricket Team ’The Plan‘ and has performed skin checks for politicians including Barnaby Joyce and Peter Dutton. Tabetha Moreto: Hello everyone, you’re listening to Health Professional Radio and I’m your host for today, Tabetha Moreto. Our guest today is Shobhan Manoharan, Dermatologist and Director of Brisbane Skin. Today, we’re going to talk about a condition known as severe primary axillary hyperhidrosis. Without further ado, welcome to the show Doctor, it’s so nice to have you here. T: Can you please tell the audience more about yourself and something about your background? M: Sure. I’m a general and procedural dermatologist based in Brisbane, Australia. I’m the Medical Director of the Brisbane Skin Group. We have four clinics situated here in this city and then the suburbs in Brisbane as well as West side dermatology and other suburban dermatology practice. We’re a full-service dermatology center where we service all types of dermatology conditions all the way from inflammatory conditions to skin cancer as well as aesthetic work. I have a personal special interest in the treatment of hyperhidrosis as well as acne scarring and later rejuvenation. I’m the Director of Training for Queensland for the Australasian College of Dermatologists. And myself and my wife Patricia, we also have a consultancy firm known as the “Manoharan Group” which provides consultancy services to specialists’ practices in terms of startups implementing systems, starting business development and making specialist medical practices saleable entities. T: That sounds wonderful. So now Doctor, tell us about this condition that involves excessive sweating in the underarms? M: Excessive sweating or what we describe as hyperhidrosis is relatively common up to 2-4% of the population will have some form of this. Now, it could either be what we describe as idiopathic so that’s basically an individual who sweats due to no particular external cause and this is due to an overactivity of the temperature control system in the brain which sort of sends the body into an excessive sweating pattern. Or it could be a secondary hyperhidrosis which is sometimes more worrying, people can get excessive sweating as a result of medications or infections and cancers and malignancies. Mainly, the biggest group of patients that we treat are the ones with idiopathic hyperhidrosis and within this group, axillary hyperhidrosis is sweating underneath the armpits is one of the big three and the other two big regions are arms themselves and face and scalp are the other two big areas. We’ve been involved in setting up a group of clinics known as the “Sweat Free Clinics” in a number of years ago and Brisbane Skin is part of this group. And we treat a lot of idiopathic axillary hyperhidrosis as well as all other forms of sweating. And we do this with the combinations of treatments including topicals, oral medications as well as the procedural and device-based solutions as well. T: That’s very interesting. So doctor, can you tell us, are there any misconceptions about this condition that drives you nuts and it keeps up at night? M: It doesn’t particularly it keep me at night but I think, one of the biggest misconceptions is that the condition is something that we really need to live with or cannot be treated adequately. Certainly for many, the group of hyperhidrosis are chronic conditions but for the majority of patients with it, there are very good treatment solutions that can keep their sweating under control and maintain their level of comfort in both emotional and psychological discomfort with it to a minimal extent. And so, what I really do urge is that both patients and practitioners look to either treat this early or if they’re unable to do so in their own experience or with their own clinical experience, they can refer on to us at an early stage. T: That’s good to know. Now Doctor if you don’t mind, can I ask you a personal question? T: Don’t worry. Can you tell us why are you so passionate about dermatology? M: I’m very passionate about dermatology because it’s an aspect of medicine which really interest me from the point of view that there is a medical component with a surgical component and there’s a significant aesthetic and cosmetic component. So the fact that this speciality encompasses all of this in the one umbrella, that gives me a good variation in my day. I can be seeing a patient with a rash one minute and cutting out a skin cancer in the next and using an injectable to enhance someone’s features the very next moment. So it’s a very varied list least and for someone like myself who likes a varied working life, this is really does suit me in and interests me directly. T: That’s wonderful to know. Doctor, I would love to chat with you more but we’re running out of time. But before we go, what is your main takeaway message to all of our listeners out there especially people with this condition? M: Main takeaway message is that there’s new effective treatments for hyperhidrosis particularly axillary hyperhidrosis. Injectable treatments that are fabulous for this reason, there’s muscle relaxant injections we can give patients which is partially covered by Medicare for patients who have failed other treatment options and this can really make a big difference and provide on average at least 5 months sweat reduction to patients. So definitely look into getting treated early and seek the practitioners that are experienced in this. And hopefully, we can make a significant impact for you today. T: That’s wonderful to know. And lastly Doctor, for those who want to get in touch with you or maybe make an appointment with you, how can they do that? T: That’s wonderful. Thank you so much Doctor for coming on the show, it was fantastic having you. M: Thank you for having me. T: And that was Dr. Shobhan Manoharan. If you liked this interview, transcript and archives are available at www.hpr.fm. We’re on all social media platforms so don’t forget to follow, like and subscribe. Show us some love by subscribing to our HPR YouTube channel. We’re also available for download on SoundCloud and iTunes. This is Tabetha Moreto and you’re listening to Health Professional Radio.